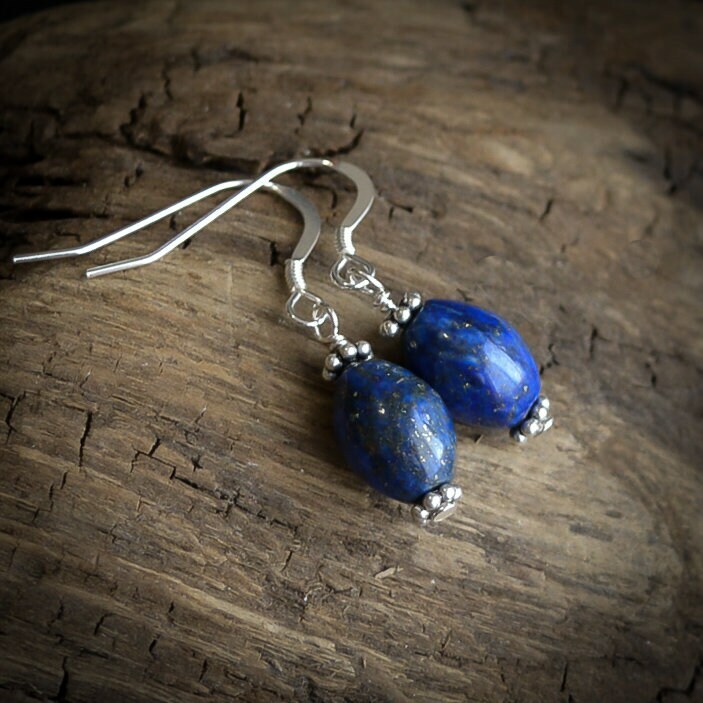 These are beautiful dangle earrings featuring Lapis Lazuli. This gemstone comes in beautiful blues with metallic golden and silver sparkle. I have accented the stones with dainty sterling silver beads and simple fish hook earwires. Delicate and lovely, so perfect. Thank you! Fabulous well-made item as always! Very dainty and pretty. The clasp is very tiny, which makes it hard to close. Otherwise I love it. So dainty and cute. Love it! I accept Postal Money Orders, and Paypal payments. Inquire for other types. All custom work is final and non-refundable. I strive to make the best quality product possible. If you are dissatisfied, you can return the product in its original condition within 14 days for resize, refund or exchange. I do not refund shipping costs. I offer free repair of minor wear and tear, providing you pay all shipping. All custom work is final and non-refundable. My default shipping is USPS First Class (usually arrives within 3-5 business days within US). International shipping is USPS First Class (air). Postal insurance is available within the U.S. upon request. Use the "Message to seller" to ask for insurance and I will add the cost for up to $100 damage coverage. Orders over $100 have complimentary insurance. International customers are responsible for any and all customs/duty/fees, etc. for your purchase. It is best to get your fingers sized by a local jeweler. However here is a handy link for easily determining your ring size at home! Otherwise, I can mail you a sizer for $1.50, which is then discounted off your ring purchase. Gift wrapping is available free of charge! Most of my designs are available for wholesale orders and consignment. Please contact me with any questions.